Panasonic opens Blu-ray 3D authoring facility in Hollywood | What Hi-Fi? 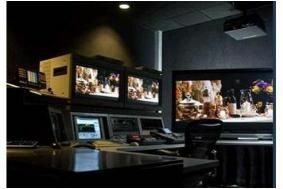 Based at Panasonic's Hollywood Laboratory R&D centre, the Authoring Centre offers studios and filmmakers Blu-ray 3D image processing, interactive programming and authoring and disc certification services, which means Blu-ray 3D discs could be commercially available from spring 2010. "Given Panasonic Hollywood Laboratory's vast experience with HD image processing, we are confident that we lead the industry with MPEG-4 MVC (Multiview Video Coding) 3D image compression technology," says Jeannine Patton, vice president of the Advanced Authoring Centre. "This laboratory, located as we are in the world's entertainment capital, is proud to offer the first complete, end-to-end Blu-ray 3D encoding and authoring facility."